Published by Cyril Huze September 14th, 2015	in Editorial and Events. Regarding the lack of water systems that could have supported sprinklers and fire hydrants, the explanation is that the county didn’t have a building code until 2010 and fire-safe construction standards haven’t been applied retroactively. Kirk Chaffee, the county’s director of equalization and planning, said that for this reason a total of 48 outlying campground areas do not have water systems. 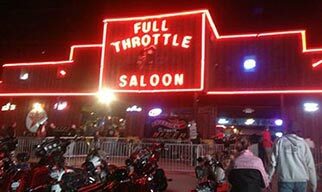 Annexation by the city of Sturgis would be an option to bring higher-pressure water lines and stricter fire-safety regulations out to some developing rural areas, “The city of Sturgis tried years ago to annex an area that included the Full Throttle Saloon, only to see owner Michael Ballard petition the matter to a public vote in 2010 in which annexation was rejected” added Chaffee. “Many who resist annexation are worried about the increased cost that comes with it,” Sturgis City Manager Daniel Ainslie added. Michael Ballard said his saloon was safe, with six large roll-up doors in the bar that could have served as exit points during a fire. “People could have gotten out of there… my donkey was smart enough to get out of there,” he said, referring to his pet that escaped the fire. that “fire” investigation sure was finished quickly …………………………..
That hair doo explains it all to me. I’m guessing none of you have a clue as to what that the town would have to do to get water out to these areas. They would be better served putting water out to the Badlands. At least there the residents are full time. Agree with RK Rider. This place has almost no population except for two weeks a year. I’ll bet all the safety complainers live in CA or NY. You don’t just snap your fingers and water appears. And running it costs a gripload. I suppose Ballard should pay for it cause he has dreadlocks and looks like a greedy stoner. Cyril published a few days ago a statement of M. Ballard saying he is not sure he has the will and means to rebuild. Does Ballard know that he will not receive any insurance money… because he had no fire insurance? So, soon the land would be for sale. An opportunity for Woody woodruff to buy the place and create a Buffalo Chip City with hotel, nice shops, upscale biker restaurants and of course a fire station.